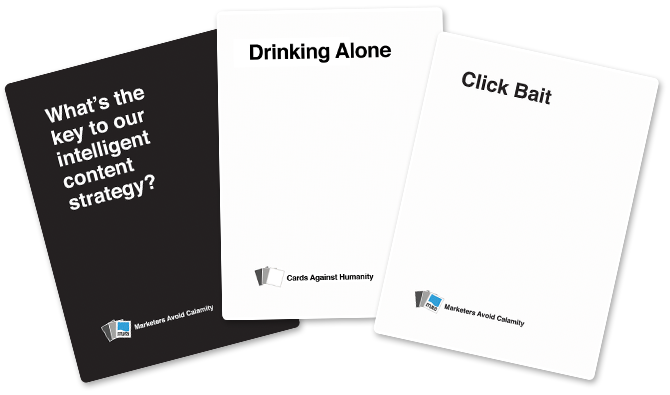 It might sound crazy, but a few rounds of Cards Against Humanity can teach you quite a bit about content personalization. I’d describe myself as a casual fan of the massively popular game, which even the game’s developers themselves refer to as the “party game for horrible people.” Players take turns matching cards that contain phrases to create hilarious — and often somewhat offensive — combinations. Think of it as the grown-up version of Apples to Apples. Each round of the game features a “card czar” who selects the winning card combination. During a rousing game with some friends, I recognized its similarities to my professional world. Every time someone new became the card czar, I noticed other players shift their playing styles to appeal to that individual’s sense of humor. Each player analyzed the audience, gained insights through trial and error and made each combination as timely and relevant as possible. We might have been playing a game, but each of us was effectively providing a series of personalized content experiences. It was almost as though we were a bunch of marketers competing for the same audience. After this realization, I started to see this seemingly trivial party game in a completely new light. The experience taught me an important lesson about storytelling. But more on that later. During a game of Cards Against Humanity, players quickly learn that no content experience is neutral. A combination of cards that delights one player might flop with everyone else. Sure, you might be somewhere on the scale of relevance, but it’s an all-or-nothing proposition regardless. You’re either winning the round, or you’re not. To deliver the most relevance — and the best content experience — players must test theories, collect data and refine their strategies. Similar to each round of Cards Against Humanity, content-driven experiences produce natural feedback in the form of engagement data. By listening to that feedback and delivering increasingly relevant experiences, marketers can increase the value they provide to their audiences. In Cards Against Humanity, players test different card combinations to gauge interest in different topics. One person might hate political jokes and love toilet humor, while another might cackle at references to celebrity gossip. Each piece of information helps players create stronger content strategies, empowering competitors to provide more personalized experiences and increase their chances of winning. In marketing, those victories help build a loyal audience, ultimately forging a meaningful connection with customers. When I recognized the depth of this connection, I knew I had to push it further. I decided to create a third-party expansion pack for the game targeted at content marketers. I brought copies of Marketers Avoid Calamity to our booth at Content Marketing World, and the game became a surprise hit with attendees. What was the most valuable for us was how it allowed us to translate a complex and somewhat daunting proposition into an instantly relatable story. In addition, it sparked social exposure from influencers such as Ann Handley. When the conference ended, we managed to land a major client thanks to the splash we made. 1. Make educated guesses, and then test them. In the first few rounds of a Cards Against Humanity game — particularly with strangers — no one knows much about anyone else’s sense of humor. To be successful at the game, players must test the waters with different types of cards and note which ones resonate with which players. This helps them home in on the best strategy for each person. Marketing works the same way. Marketers collect as much data as possible while performing interviews for persona creation. Once they have established a data baseline, they hone their approach to ensure the story they are telling is relevant. Start with one part of the sales funnel, and test new content pieces on a small segment of prospects. According to Marketbridge, 76 per cent of B2B buyers prefer content tailored to their stage of the purchasing process. And middle-of-the-funnel educational content is frequently overlooked. Pick a geographic region or a persona, or use an account-based marketing approach to target multiple roles within a specific company. Then, measure engagement with the experiences you create. If something works well, expand and refine your efforts. If something flops, try a different approach. 2. Sneak a peek at the competition. In Cards Against Humanity, players don’t just learn from the cards they play. They see when other players succeed and fail, too. If someone fails spectacularly with political humor while another player gets big laughs with a raunchy card, both players learn from both experiences. Collect and analyze the content your competitors produce. What works for them? What ideas are worth borrowing? What do their failures say about your shared audiences? Use this information to design a content mix that resonates. According to DemandGen Report, 61 per cent of buyers say their winning vendor provided a better mix of content than other options. Stand out from the competition by being relevant. 3. Adjust as you go. Rounds of Cards Against Humanity take only a few minutes, but marketing never really ends. That said, you don’t want to rest on your laurels. Marketbridge also found that 72 percent of B2B deals end in either no decision or a refusal to purchase. Improve that figure by responding to your audience’s evolving personalization needs and continually delivering relevant content. 4. Use past successes to build stronger campaigns. When I play Cards Against Humanity, I take approaches that work on one person and try them on someone with a similar sense of humor (noting a need for nuance) — a form of “persona-ization,” if you will. It’s a great way to be relevant at the outset, and it allows for increasingly better opportunities later in the game. After following these steps to build a better content personalization strategy, don’t stop improving. Use customer metadata and buyer behavior to expand into new demographics while maintaining your momentum. Per Salesforce, 86 per cent of senior-level marketers believe a cohesive customer journey is crucial to success. Test and refine with one group, see whether the same approach works with another, and adjust as necessary to give every prospect a relevant experience that feels personal. Every customer interaction, just like every hand in Cards Against Humanity, is an opportunity to gather insight. Players and marketers alike can then turn around and use that information to deliver more relevant content in the future. Don’t try to win the game by fumbling around in the dark — listen to the other players and rely on their feedback to create stellar strategies.